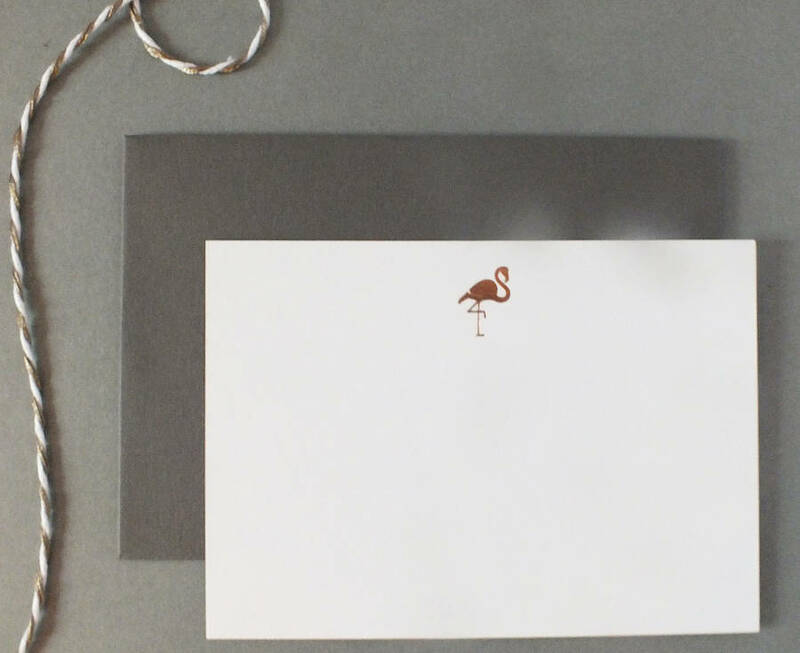 A set of six luxury notecards featuring an elegant rose gold foiled flamingo. Our notecards come with corresponding, heavy-weight grey envelopes and are packaged in a clear box. The perfect modern, timeless and elegant gift for all stationery lovers. Hot foil stamped in rose gold foil. The uncoated smooth surface of our card stock and its crisp white shade has a luxurious, yet very natural feel to enhance the image and ink written upon it. The front of the notecards feature our designs only and the reverse features our logo, also in rose gold foil. All of our products are designed, manufactured and distributed in the UK using a sustainable supply chain. Hot foil stamped onto luxurious 350 gsm FSC accredited card stock. This product is dispatched to you by DEAR TO ME STUDIO.